Do you have what it takes? Join us June 11th, 2016 at Sedgwick County Park for the Wichita Gladiator Dash. 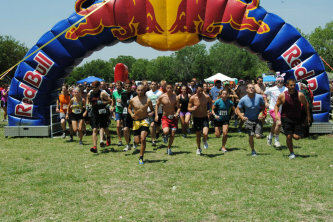 This action-packed 5K race includes multiple obstacles, water and mud, challenging both your endurance and your mind! Can you survive? Sign up early for only $49 per participant! Early registration ends February 2nd. Please register on or before this date to take advantage of our early registration pricing of $49 per participant. After that, the price will be $59 per participant. Sorry, no refunds under any circumstances. You must be 14 years of age or older to participate. If under the age of 18 you must have parent’s signature and documentation when registering. For more information, or to register, please visit wichitagladiatordash.com.